The Flexenbahn cableway will open in the winter of 2016/17 and will connect the skiarenas of Lech/Zürs-Schrocken/Warth with Sankt Anton/Sankt Christoph/Stuben. The new link between Zürs and Stuben/Rauz will make Ski Arlberg the largest contiguous skiing area in Austria with 305km of ski slopes served by 87 ski lifts. The Flexbahn will be a gondola with cabins capable of holding 10 passengers on the 6 minute journey. It will have large panoramic windows to take in the spectacular views of the Arlberg Pass and it’s capacity will be 2.400 people per hour. Also, as a return route a 1.8 kilometre long piste descending 562 vertical metres will be created. In addition, the Trittkopf I and II lifts will replace the old lift from Zürs, which will be rerouted into a dogleg with a middle station. The Flexenbahn lift will join at the midstation, giving skiers the option to descend to either valley or to head up to the Trittkopf top station. 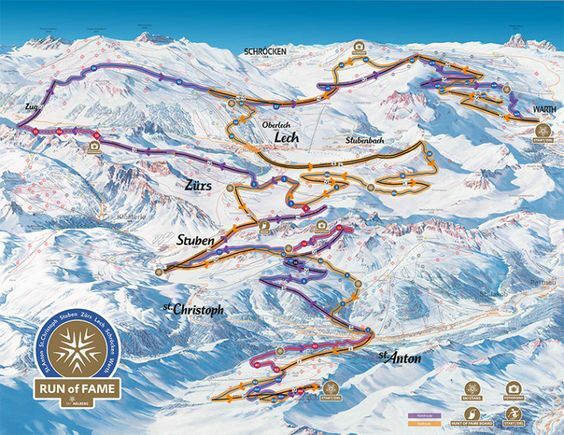 The Albona lift will start at Alpe Rauz and head up to the top of the Albona ridge, which is currently served by two slow and notoriously cold chairlifts from Stuben. Ski Arlberg will combine legendary runs as "The White Ring" and the "Tannbergrunde" and create a new ski circuit called "Run of Fame". The route will extend from recently connected Warth to the north via Lech and on using the new Flex lift to St. Anton / Rendl in the south of the region. This new round encompasses the entire dimension of the Arlberg - Warth-Schröcken via Lech to Sankt Anton. To cope with this ski circuit the average skier needs about an entire day and is rewarded with a distance travelled of 65km. We can't wait to ski this massive and diverse circuit! With 305km of piste Ski Arlberg overtakes the Val d’Isere/Tignes Espace Killy region with 300km and the Grand Massif in France, but remains slightly smaller than the 4 Valleys (FR/CH), Paradiski (FR), and The Milky Way across the French/Italian border which each claim around 400km of linked runs. Although we at Skiweather Europe do not take the indications of the extend of the skiarenas very seriously, it does signal that Arlberg Ski challenging the big French skiresorts in the league of legends. Skiweather Europe already classified Ski Arlberg as the most snow reliable skiregion based on long-year snowstatistics. The announcement of Ski Arlberg comes a few months after the opening of the TirolS connection which joined Fieberbrunn in Tirol with Saalbach in Salzburgerland claimed to be the new largest ski area in Austria, overtaking the long standing claimant, Skiwelt in Tirol, although the Skiwelt dispute that claim. The discussion should not focus itself on who is / has the biggest. The new Flexenbahn is a huge improvement for the environment. The connection between Stuben and Zurs will make travelling along the Flexenpass redundant; the number of daily bus trips between Zürs and Stuben/Alpe Rauz will be reduced by 120. In addition, the air quality of the resorts will improve as fewer cars will come directly into the villages.